Lowering a person puts the force of gravity on the side of the rescuers, and therefore it's the preferred way to go, but sometimes there's no alternative to raising a victim up a steep face. Rescuers then have a choice of two general methods: the prusik system, which depends upon the victim's own efforts, and the pulley system, in which rescuers do the lifting. 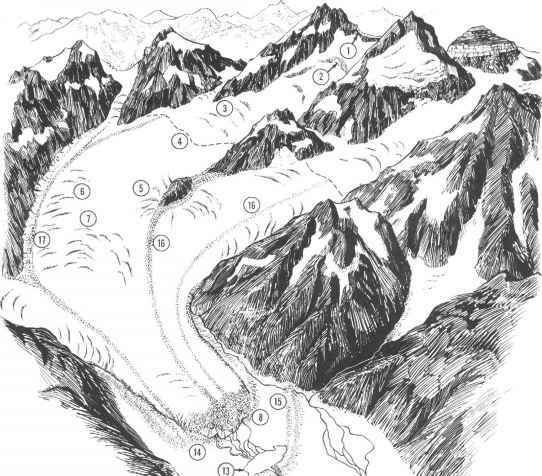 These systems work on steep rock, snow, or ice, but they are usually associated with crevasse rescue. (Several versions of these systems are described in full in Chapter 13.) The same safety precautions that apply to lowering injured climbers apply to raising them. Whenever possible, safeguard the injured person with the use of backup anchors, safety prusiks, independent belays, and with padding or other measures to prevent ropes from being cut on sharp edges. In the prusik system, the climber carries out a self-rescue by ascending in slings that are tied to the rope with prusik knots or other friction knots or that arc attached with mechanical ascenders. This is an exhausting technique and has limited use in evacuating a seriously ill or injured person. For a pulley system, rescuers usually use the Z-pulley, the most mechanically efficient of the basic pulley methods. There are some precautions to observe in using the Z-pulley: establish a main anchor that is bombproof. Keep extra prusik slings handy for replacements if a prusik in the system jams—and have a knife ready to cut away the jammed sling. (Caution: ropes and slings under tension cut very easily, so always cut away from other ropes.) Keep in continuous communication with the person you are raising. Also be careful that the haulers don't pull too zealously on the rope. The Z-pulley is a powerful multiplier of forces, and it's possible to yank out an anchor, break a rope, or further injure the climber by pulling too hard against excessive friction or an unexpected obstruction. Many rescuers prefer prusik knots to mechanical ascenders in a Z-pulley, because of the possibility the ascender could fail or could damage the rope. Give the prusik at least three wraps around the rescue rope. Each time you reset the Z-pulley, check that the prusik is holding securely.